 Mouse anti Human Factor VIII antibody, clone RFF-VIIIC/10 recognizes human Factor VIII, an essential blood coagulation factor. Whilst circulating in the blood, it is mostly stably complexed to von Willebrand factor. It is activated through cleavage at various sites, dissociates from the complex and interacts with Factor IXa, in the presence of calcium ions and phospholipids, to convert Factor X to the activated Factor Xa, which activates thrombin. Thrombin cleaves fibrinogen into fibrin, which polymerises and cross-links to form a blood clot. The activated Factor VIII is proteolytically inactivated and cleared from the bloodstream. Defects in Factor VIII cause haemophilia A (HEMA), a disorder characterised by the body’s inability to control blood clotting. This could result in severe blood loss, even with minor injuries. Mouse anti Human Factor VIII antibody, clone RFF-VIIIC/10 recognizes an epitope within the non-functional, middle domain of full-length Factor VIII. Rotblat, F. et al. (1983) Monoclonal antibodies to human procoagulant factor VIII. J Lab Clin Med. 101 (5): 736-46. Tiarks, C. et al. (1987) Identification of six functional clotting factor VIII:C epitopes by analysis of cross-reactive public idiotypes in murine monoclonal VIII:C inhibitors. Thromb Res. 45 (5): 527-37.